Steamed sea bass fillets cooked with red pesto and pink peppercorns, served with a tomato risotto. Prepare the pesto paste: Using a pestle and mortar, crush the basil leaves, 30 g of tomatoes, the pine nuts, the garlic and 30 g of Parmesan. Add 150ml olive oil and crush to obtain a smooth paste. 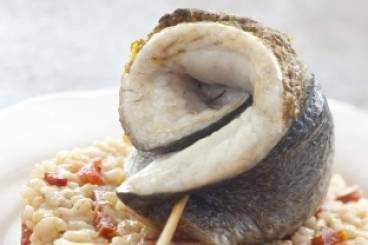 Use a fish bone remover to remove the bones from the sea bass fillets. Use a very sharp knife to gently lift the skin from the fillet. Place some of the pesto in this gap between skin and flesh. Season the fish with salt and Espelette pepper. Roll the fillet up and secure with a short length of string or a cocktail stick. Finely chop the onion finely. Trim the chorizo, cut in to small slices. Cut the remaining tomatoes into small slices. For the risotto: Heat a frying pan, add some olive oil and sweat the onion. Add the rice and cook until transparent then add the white wine. Gradually add ladlefuls of water to the rice, letting all the liquid be absorbed before adding more. After about 10 minutes add the finely chopped sundried tomatoes, the sliced tomato and the chorizo. Continue cooking until all the water has been added and absorbed - this should take about 15-20 minutes. Once the rice is cooked, season and add a knob of butter. Mix well and add the parmesan. While the risotto is cooking, cook the sea bass fillets: add some water and the pink peppercorns to a wok. Bring to the boil and place a grill rack over the wok. Place the sea bass fillets on the grill rack and cover the wok with a lid. Turn off the heat and allow the fish to steam for 6-7 minutes. To serve: place a serving of risotto in the centre of large dinner plates. Place the sea bass on or next to the risotto. Decorate with a few fresh herbs and serve immediately.